Antwerp may not leap instantly to mind as a short break destination - but there are few more rewarding choices. Go for the lovely old city centre and the paintings of its favourite son, Peter Paul Rubens. Go for the excellent museums, the huge choice of restaurants and pubs and – of course – the frites and the beer. And go by train. Taking advantage of a deal from Eurostar allowing travel to any station in Belgium we started at St Pancras International and switched smoothly to Belgian Railways at Brussels Midi/Zuid (note that Eurostar does not run to Brussels Central). It took maybe 6hrs from home to the hotel lobby against a realistic 4hrs if we had flown from London City Airport but that extra 2hrs was spent relaxing, reading, watching the countryside flash past and – as we were travelling in Standard Premier – enjoying continental breakfast at our seats in both directions. 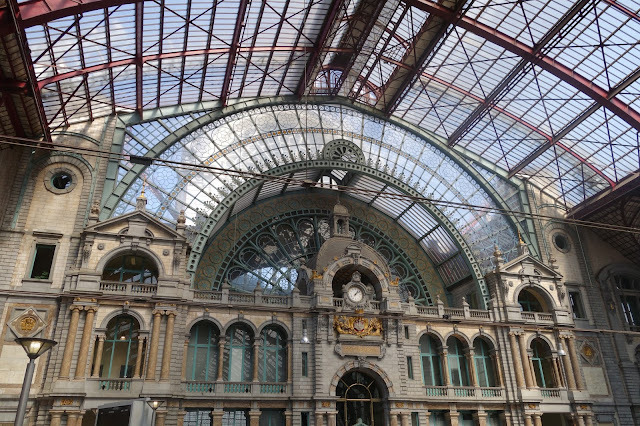 You could take a tram from Antwerp's breathtaking central station but a taxi to our hotel, the Rubens-Grote Market - a short step from the cathedral - cost around €10. Eurostar has just launched a range of new fare deals, including travel to any Belgian station for £35 in Standard class or £87 in Standard Premier. Tickets will be on sale from August 27 until September 8 and will be valid for travel between September 25 and April 25 next year. A word of advice: Eurostar’s website says you may travel on any service except those by high speed Thalys or ICE (Inter City Express) trains. You may be confused by the designation of Belgian trains as IC. Don’t let this fox you. Tickets to Antwerp or any other Belgian destinations are valid on those trains.